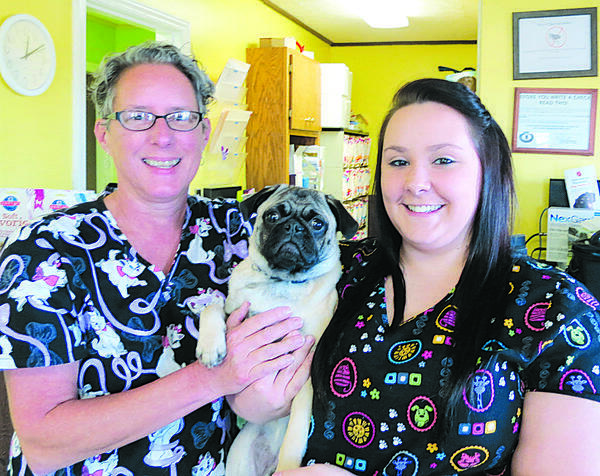 Holding their pug patient Wilbur, owned by Mallory Skaggs of Hodgenville, are, Carol Tucker, left, and Harley Walters, part of the LaRue County Animal Clinic staff. The facility includes a well-stocked pharmacy, in-hospital surgery suite, in-house x-ray capabilities including both a conventional x-ray unit and a dental x-ray unit, and a closely supervised hospitalization area. Their patients have included some uncommon pets. 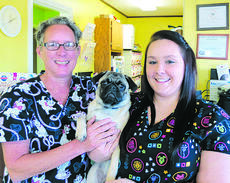 Durham treats all animals, small and large, alternating his hours at his practice in Hodgenville with an office, Green River Veterinary Services, on New Columbia Road in Campbellsville. For more information, contact the Hodgenville office at 270-358-4474 or the Campbellsville office at 270-789-4646.